When this interesting theme was announced by Kalyani who blogs at Sizzling Tastebuds, I was a little confused. Do we cook a western dish with some desi twist to it or cook a desi (Indian) dish and give it a western twist. Fortunately she explained what she wanted us to do, give the Indian dish a western twist. Confused still?? I’m still frowning and thinking. However the recipe below will explain how I understood the theme. Coming to Kalyani’s blog, its worth a visit as she has many healthy and vegan recipes. Find some interesting egg free bakes too. When I had to decide what to make, my choice was limited to the ingredients present in my kitchen as soon I’ll have to close this kitchen(Bangalore home) down as I’m traveling in April. I didn’t want to buy any new ingredients. Luckily, I had brought some spices from my Mombasa kitchen and one of them was a bit of taco seasoning. So the whole recipe had to revolve around that ingredient. Did you know that now the nachos sold in India are not just the imported ones but some local ones too? I had bought a packet of nachos manufactured by Parle and liked them. So nachos and taco seasoning gave rise to an interesting dip. Pav bhaji is a quintessential street food and very popular. Its basically mixed vegetables cooked with onions, tomatoes and spices, meshed up a bit and served with lightly toasted buns. The main taste is from the pav bhaji spice mix which can be ready made or homemade. With Holi coming up soon and people looking for different snack ideas, I thought this would be perfect. Make the pav bhaji dip the previous day and serve it with nachos. You may wonder what is Pav Bhaji. Pav in Hindi is bread and bhaji is a curry or vegetable. For pav bhaji, a mixture of vegetables are cooked with onion, tomatoes, garlic and special pav bhaji masala (spice mixture) is added. The bhaji is mashed up coarsely and served with a heavily buttered pav or bun which is lightly toasted on a big pan or tawa on which the bhaji is made. Its a very famous street food all over India. Instead of the usual veggies like peas, potatoes, carrots, cauliflower I also added broccoli stems, mushrooms and zucchini. Instead of the pav bhaji spice mixture I used taco seasoning. Indian and Mexican cuisine use similar spices so it was not that difficult to make this starter dish. You have the option of grinding the cooked veggies or bhaji coarse or into a thick smooth paste. Mine was the latter as its not messy at all to eat. No dripping and the dip can be easily scooped up by the nacho. Prepare the vegetables, peeling and chopping them all more or less equal size. I usually use peas as the guideline. Steam or boil carrots, peas, beans, potatoes, broccoli stalk if you’re using any. Add cumin seeds and let them sizzle. Add chopped onion and stir fry them till it becomes soft and begins to brown a little. Add garlic and ginger paste. Stir fry them for a few seconds. Add chopped zucchini, cauliflower, mushrooms if you’re using any at this stage. Mix well. Cover the pan and let the vegetables cook on low heat for 2-3 minutes. Add the tomato puree, red chili powder, chopped coriander and salt. Cover the pan and let the tomato puree cook for 2-3 minutes over low heat or till the vegetables are done. Add the steamed or boiled vegetables. Add water. Mix well. Cover the pan and let the vegetables cook further for 4-5 minutes. The vegetable mixture or bhaji should not be watery. Add the taco seasoning and lemon juice. Mix well. Take the pan off the heat. Let the bhaji or veg mixture cool down a bit. Puree it with a hand blender or in a food processor. Mix the chopped spring onion, coriander and tomato together. Sprinkle with a bit of salt if you like. Sprinkle it on the dip and serve with nachos of your choice. Use vegetables of your choice. Adjust the seasoning according to your taste. Serve with lemon wedges on the side. The dip tastes good even when its cold. You may serve it cold or warm. For more variety serve the dip with pita chips, potato chips, celery sticks, croutons etc. 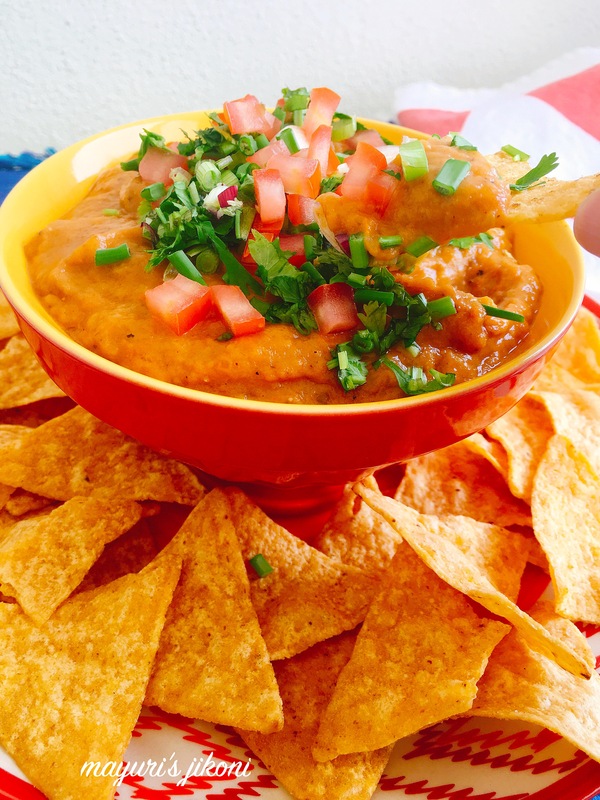 Loved this Mexican twist on Indian Pav Bhaji and served with nachos!! Also liked the addition of other vegies like broccoli stems in it to make it more healthy and fibrous!! Perfect for any party or movie night get-together!! Thanks Swati, broccoli stems were just there in the fridge and used it up. Also a good way to get kids to have broccoli. That’s true Renu a bit of left over pav bhaji would make a great dip. This is a novel idea of a fusion dip.. must be tasting awesome. I have to try it for sure. Thanks Shobha, and please do try it. Thank you so much Sujata. I use bhaji of leftover pav bhaji as a spread on toast , using it as a dip with tacos sounds great di ! That’s a good tip Poonam, to use it as a spread, sounds yummy. I think we Indians are best in preparing fusion dishes, in every videshi dish just add desi tadka. such a delicious and tasty looking dip, that goes well with nacho chips. Thanks Vanitha and most welcome. Hope you and your family love it. Lovely twist to our pav bhaji.. unique combo and I am sure it will taste delicious. BTW can you tell me about foodiemondaybloghop group please? Thanks Narmadha. Please share your email address with me and will write to you what the group is all about. Check your email, I’ve sent the info. What a lovely fusion of classic desi dish. It looks so delicious. I make fondue with pav bhaji many times. Next time serving with nachos for sure. Thanks Lata, I will have to try the pav bhaji fondue. Thanks Sasmita. I finished half of it. Thanks Archana, do try the Mexican version of the pav bhaji dip. Mexican is one of my favorite cuisine. I am in awe of this wonderful recipe. Such a fab idea to make Pav bhaji dip.Bookmarking this recipe. Pav bhaji is definitely everyone’s fave dish 😍 giving it a western twist? Well, I will try out this recipe. 😊 Already can tell that it would be delicious. Thanks Snehal, please try it and let me know how it was for you. I love Nachos and with this nice dip it should be a great treat for self & friends & visitors. This looks like the perfect chips and dip recipe for any party, and it’s so straightforward that even I can make this in a pinch if needed. Thanks for sharing! Thanks and hope you do try out the recipe. This looks incredible? Can’t wait to try this recipe out. Thanks, and please do try it. I can already see how delicious this pav bhaji dip is with those yummy nachos. Fantastic recipe for a fun night with friends! I love the idea of an Indian veg dip with nachos! Def want to give this recipe a try! The sharing of food ideas is responsible for some of the worlds finest foods, I love the sound of this, proper tasty. Thanks for the lovely comment. That sounds like such a flavorful dip! I have a lot of parties on my patio in the summer, so I can’t wait to try this! Try it Beth, am sure it will be a hit.